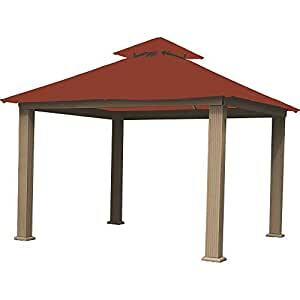 Proudly Made in the USA, the ACACIA 12ft x 12ft Gazebo Terracotta OutDura Canopy offers you the ability to extend your outdoor covered living area with the safety and security provided by the heavy duty, but simple to assemble frame. The rust free Structural Extruded aluminum frame will last a lifetime. The Electrostatic finish makes the frame even more durable and attractive. Designed with a hidden ground attachment system the ACACIA 12ft x 12ft Gazebo Antique Beige OutDura Canopy will stay where you want it to stay. The ACACIA Gazebo Program incorporates over 80 years of American know how into the design and construction of each Gazebo. From the quick assembly sculpted heavy-duty legs that can support over 1000 lbs. each and quickly snap together, to the unique frame design. The ACACIA Gazebo OutDura Canopy features two piece covers that are designed to allow for ventilation under the gazebo and to help ensure that wind and updrafts donât cause damage to the gazebo canopy. The canopy is constructed with OutDura branded Acrylic Marine fabrics proudly made in the USA. The factory precision laser cuts each of the canopy tops for the best fit. With 36 total colors available, we are sure that there is a color to match your exterior and your needs. The OutDura canopies are UV protected, and designed to resist fading and staining for 7 years. With a simple design, the canopy can be easily removed during winter months, extremely windy conditions, or for cleaning.